I was born during a blizzard and had my first iceboat ride at the age of 9 months.Sounds crazy doesn’t it? You’ll have to take my mothers word for that, because the first iceboat ride I remember was at age 3. The boat was named “Bouillon” and was owned by Russ Poouliot who later won fame as a naval architect and sailor. Russ kept the boat in front of the boathouse in which we lived – on the shore of the Detroit River. Another figure in my early iceboating exposure was Captain Ed Rooney. One day, Cap was going to race an “R Boat” – 250 sq. ft. – gaff rigged. There were more than a dozen of the class on Lake St. Clair and the owner the R10 named “North Wind” was getting married that day and wanted Cap Rooney to race the boat to keep his points up for their season’s championship. I was about 10 at that time. Cap invited me to go along. They used to sail a triangular course in those days and could almost sail the course without tacking. We did poorly in the race. The “North Wind” was a heavy weather boat and we had light winds. I made a model of the “R Boat” soon after. It was about 18″ long and without having any measurements to go by, I proportioned it from memory. I wasn’t supposed to use my mother’s sewing machine, but I would sneak the use of it when she wasn’t at home. About two years later, we moved from the riverfront, and I was stuck with making the drapes for our new home because my mother said I could sew straighter than she could. Anyway, my model iceboat wouldn’t sail. The resistance on the lee runner made the rear runner pick up off the ice.I found an old cable clamp and put it on the backbone ahead of the rear runner and the model sailed like crazy. Incidentally, all stern steerers have the same problem as my model. After my first racing experience, I went out to Lake St. Clair by myself whenever I had the opportunity or the fare for the interurban railway. I tried to be inconspicuous and keep out of the way, but in time I guess “that kid out there alone” was noticed and one of the sailors named Frankie Senter, who owned the R Boat “Senter Rush”, asked my name. It turned out he had known my father. Frankie lived only a few blocks from me (I found out later) and somehow felt some responsibility for me and although I didn’t want to be a bother to anyone, Frankie insisted I go back to town with him and his crewman. 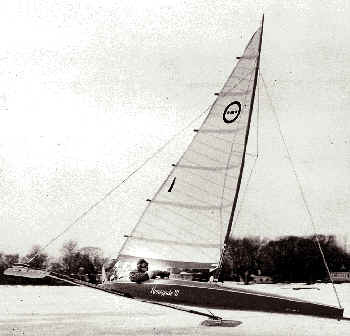 Frankie kept the iceboat at Joy’s boathouse which is now Crescent Sailing Club and is two miles down the shore from where they raced, (which is now at the present site of the Grosse Pointe Yacht Club). We had to sail far out onto the lake because of open water and to this day, I can still feel that icy cold wind biting my flesh. I was in the forward basket and when I thought I couldn’t stand it any longer, I rolled over the backbone to the lee side whenever we came about. I must have been partially obstructing Frankie’s view because he motioned to me to stay on the starboard side. He couldn’t have known how cold I was. I was surely glad when that ride ended. We moved away from the riverfront in 1924 and although I kept in touch with old friends and acquaintances, much personal involvement suffered. I still managed to get out to Lake St. Clair occasionally and the racing site gradually changed from 8 Mile Road to 9 Mile Road to Masonic Blvd. and eventually Mt. Clemens. After dropping out of high school, I got a job on the railroad. I guess being steadily employed all through the Great Depression had it’s compensations, but I always seemed to get the 365 days a year jobs with 12 hr days. This left very little time for recreational endeavors, although I could afford a car to get around in. I happened to be at Mt. Clemens when the group from the Detroit News workshop brought out the original DN iceboats they had just finished building. Only a few of the fellows were sailors, and very few iceboat sailors. The wind was blowing a good 25 mph with gusts over 30 mph. The inexperienced sailors wanted to see their boats sail and asked some of the experienced sailors to sail them. The boats were, of course, not designed for this condition and as soon as they were seriously sheeted, many broke in two. The plans were soon changed to allow deeper side panels which took care of the problem. The same group originated the Detroit Ice Yacht Club. Many of the original DN group gradually switched over to the Class E, and while there were no plans available, talent and ingenuity was prolific among the group. They had machinists, pattern makers, welders (some owning their own shops), and the rest were exceptionally gifted handy men. Everyone took pride in doing their own work and sharing ideas. I got back into the iceboat activity when a friend bought an old Palmer Skeeter. He was unable to sharpen runners, so he called on me for the job. In return, I got to sail the boat part of the time. That’s all it took to get me really “fired up” and a couple of the group wanted to build DNs and didn’t know how to get started. They asked me to join them and guide the operation. I was less than impressed with the DN, but it was a way to get into competition. The problem at the time was the Detroit Ice Yacht Club couldn’t make up their minds what a DN really was. Almost anything you could do to a DN would make it a better boat and certain changes were tolerated. I didn’t belong to the club, but I was invited to attend meetings. I wanted to know if I was building into a one-design or an open class. A friend owned DN #38 and when building it put considerable crown in the front and rear deck. This made it look so much better, and at the time was allowed. The sail material and batten arrangement was a “farce” and the club agreed to allow heavier sail cloth and five horizontal battens. This was my signal to go ahead with our plans. We bought material for 3 boats and I ordered 3 sails of 8 oz. Wamsutta with 5 horizontal batten pockets. This was in October of 1940. We were held up about 2 weeks awaiting a contract closing on the house in whose basement our project was to take place. We no sooner got comfortably started when the Detroit Ice Yacht Club rescinded the allowable changes and reverted to the originally modified plans. That was it, as far as I was concerned! The three of us were stuck with sails and material for 3 boats, but I just couldn’t bring myself to build to the original plans. I told my two companions in the project that I was going to design my own boat and left it to their choice to do as they chose. They elected to do whatever I did, so I got out the breadboard, some shelf paper, and a yardstick, sat down on the floor and took measurements. I was the biggest of our trio – 6’1″ – 190#, so they could fit into anything I could. I first laid out the mast and sail plan and drew the boat under it. The fuselage was 17’ 6″ long, 20″ wide, and 16″ deep. I had always thought foot steering should be used although there were stories about it had been tried, but did not work. Due to limited space, I couldn’t make the fuselage blend with the DN’s 60 sq. ft. sail plan. I designed the steering geometry so that the foot pedals were unequal in operation. The one you pushed on traveled farther than the opposing pedal returned. I felt the sail plan could stand a 12’ runner plank without sliding out, so that became the width. I knew the 12# DN mast that was already completed wouldn’t stand the extra strain the larger platform made available, so I put diamond stays on it, hoping it would last until I had time to design and build a proper mast. A lot of corners were cut to get the boats on the ice before the season ended, but at long last, the day arrived. After knocking off work a 3 am Sunday, February 23. I was back at 9 am for the finishing touches and loaded the boat on a makeshift rack atop the car – and off to the lake. We had quite an audience while setting up the boat because the wind was so light no one could sail. But my boat didn’t seem to know this and took off like a bird. I can’t explain the feeling of pride and exhilaration. All the hours of labor, the 16 hr. day weekends with no power tools except a 1/4 HP motor and small belt driven arbor, the wearing out of two breast drills – seemed worthwhile that late Sunday afternoon. The season only lasted long enough for me to find out my brilliant idea for runners didn’t work. I still can’t figure out why. I had the outside edge of the runner perpendicular with a 45 deg. inside angle. The theory came from how the angle on my ice skates performed, but it didn’t work on an iceboat. The next season, I had my new mast which was thinner and wider, much like the Renegade mast of today, but was only 1 7/8″ thick and 6″ wide. It seemed to add about 25% more power to the sail plan. In the meantime, I changed jobs – had more time and less money. Money, of course, was always a problem. At this juncture, I had about $70 invested. The sail portion of that was $32. I joined the Detroit Ice Yacht Club and because my boat out classed the DN’s, I had to race against the very formidable Class E fleet. My boat was very impressive in competition, but it seemed Saturdays were the only days we had anywhere near racing condition and if you won a Saturday race, it wasn’t given much credence because due to W. W. II, many of the group had to work Saturdays. Finally, in late February, the conditions for our first Sunday regatta of the season arrived, and everyone was “champing at the bit”. We had good wind (about 20 mph) and a good course. I finished a close second in the first race and also in the second race, but the fellow that won the first did poorly in the second and the fellow that won the second race did poorly in the first. At this point, I was leading the regatta. This was almost unbelievable and must have been a big boost for my morale, because I won the third and last race very convincingly. After the race, the competing skippers surrounded me on the ice, got down on their hands and knees, and “salaamed”. Words can’t describe how I felt. Discharged from Uncle Sam’s service in October of 1945 left little time to make changes in my boat. The principal change was the addition of the springboard. Gordon Reid of Toronto was the originator of the idea, but his version was to install it under the boat. I don’t know whether it was Bob Miller or Nub Sarns who thought of projecting it out in front 3 feet. It not only increased the “wheelbase”, but increased the hiking angle, making the boats more stable and fast. Gordon claimed only hickory would take the beating. Bob and Nubs used ash. I used Sitka Spruce and extended it to 50″. Gone were the days of sailing all winter with a sore tail bone. To this day, I still think, in that configuration, it was the best ice boat ever put on the ice – fast, maneuverable, controllable and only 185 pounds – ready to sail. What we have gained since in speed – which is only relative – hasn’t, in my opinion, been worth the cost and effort. However, all the ideas I had been storing in my head, were straining to get out and this boat was just to get me through the first post-war season. The bonanza of material available after WWII was a gadgeteer’s dream…turnbuckles, sheaves, cable, aluminum at 25c/lb, aircraft shackles, bolts and nuts at 20c/lb… However, Sitka Spruce was not available for building my dream boat from scratch — so again I had to draw on my talent for improvising, this time to get me through one more season a little more competitive with our “hot” E Fleet. My 17.5’ fuselage and 50″ springboard were all I could use to start with. I designed a new mast, boom, runner plank, and webbed runners for the so called “dream boat”. The allowable 75 sq. ft. sail I thought was a bit much for the platform, and to keep a certain esthetic value and proportion, I settled for less. The fuselage was originally designed without chines. The side panels were sufficiently strong for the original design, but the larger platform required greater strength. Marine plywood was still unavailable so I added 5/8″ side panels over the originals and tapered the thickness to zero at each end. Sailcloth was no longer existent at that time, but Nylon was being introduced as a substitute. Nylon rope wasn’t invented yet, so the old standby, Italian hemp, had to be used. The two materials were not compatible because of the extreme difference in stretch, however, it was better than nothing. Despite the shortcomings, the boat performed even beyond my expectations. The acid test was the 1947 ISA regatta at Lake Geneva, WI. The boat had been sailed but, not raced up to this time, and taking time off from work to go sailing was unthinkable. However, my friend, who had been updating his boat, along with me , planned to go too. After work on Thursday, we went out to the lake and loaded the two boats complete, on his 1941 Pontiac. We finally arrived in Lake Geneva after 29 1/2 hours on the road. (Car troubles slowed us down, but Cora Lee was the “Eternal Optimist” and kept us going) Since there were high winds on Friday, there was no racing. I had lots of help unloading and rigging my boat. There had been a lot of talk about the influx of the “Big Detroit Boats” some of which had 22 ft. hulls with springboards, 20’ runner planks and 22’ masts. Here was the smallest boat in the fleet. After rigging, I set out for a test sail. The wind was averaging around 36mph and the temperature was 3 deg. above zero F. I barely got out of Williams Bay when the first blast hit me and I immediately came back in to await the time when I had to go out. As the first race got under way, everybody was practically flying and one spot on the course was particularly hazardous due to the way the wind came out of Williams Bay. Several boats broke up in this area and although I was prepared for the blast, it was even more severe than I had anticipated. On the second time around, the blast hit so hard there was a loud bang and the mast came down. You can imagine my consternation sitting in the boat – all those hours on the road – all the grief — and all for naught. The compression came off the boat, the mast was down and as I coasted and eased the sheet, the rig started shaking and went up. I couldn’t believe what was happening. I quickly surveyed what had happened. The port diamond stay on the mast had come detached from the spreader allowing the mast to bend to excess. It must have bent like a fish pole to have gone so far as to relieve the pressure from the boat and the lower third of the mast to be horizontal from the ball mast step. As I grasped the situation, it appeared there was only one boat ahead of me so I thought I might finish the race by being extra careful on starboard tack. This was easier said than done. As a blast of wind hit, the mast popped out about 3’ before I could ease the sheet an inch. On the next lap, as I was catching the only boat ahead of me, his mast came down, leaving me with only the problem of survival for the balance of the race. The irony of it all is that I was disqualified for touching a mark on the course. At home, we did this regularly. It was a sacrilege to knock down a mark, but sloppy sailing to miss it completely. This was a costly lesson: abide by the rules. For the next race, the diamond became detached again and I withdrew since I no longer had a chance of winning the regatta. It seemed more important to keep the boat in one piece. In the last race, I felt I had all the problems sorted out and had a chance to sail the boat to it’s full potential which proved to be more than adequate for a very convincing win. This was only the beginning of many races to come. However, I still had ideas for another boat. One day Nubs Sarns and Hank Burkhard approached me and asked, “We hear you have ideas about building another boat”. When I answered “yes”, Nubs asked “Would it be bigger?” The answer was still “yes” and Nubs said, “Good, we don’t want a these bigger boats. (skeeters) We’re tired of hauling around these big clunkers (skeeters). We want what you’ll have. Wouldn’t you give up your ideas for another boat and make a lot of people happy by making plans of your boat available, so we could form a one-design association?” After very little deliberation, I agreed. Up to this point, I had very little on paper. Almost everything was made without drawings. This project had to be different. I bought the drawing material I needed and was invited to use Boston sail loft for my full size layout. We lived in one room apartment at the time, so I bought a 4x8 piece of plywood and after dinner, my “drawing board” was supported by the dining room table and the ironing board. This worked out well for detailing and after finishing the plans, I turned them over to a Naval Architect for a real professional job. The non-profit association formed was to not sell plans, but to include them with first years membership dues. The first year, besides scattered memberships all over the sailing area, fleets were building in Toronto, Toledo, and Detroit. At a Detroit regatta, of 42 boats on the starting line, 22 were Renegades. My boat still did most of the winning and in our fleet we tried switching boats in “scrub races”. Whomever sailed my boat won. This seemed to impart some sort of message to some people even though I was handicapped trying to sail someone else’s boat that was set up for someone 6″ sorter than I. Less than subtle suggestions were made that I should build a new boat (according to the plans drawn up) to eliminate any “magic” inherent in Renegade II. This was of course a challenge I couldn’t refuse. I sold Renegade II at the end of the 1949 season. I was late getting Renegade III on the ice for the 1950 season. We were snowed out at the Northwestern Regatta, and I couldn’t make it when it was run later. We did, however, get in the Gar Wood Regatta and all 5 races in the International Skeeter Assoc. 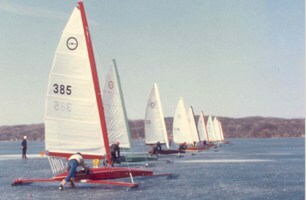 (ISA) Regatta. Despite the usual new boat problems, the record for Renegade III that first season was: 19 races — 17 firsts, 2 seconds.